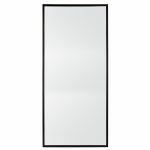 The Monte floor mirror is timeless and curated with elegant balance with a nod to the simple proportions of modern decor. Casual yet refined, eminently versatile, works best being layered behind furniture or equally free standing and is so very livable. The oversized mirror is an amazing piece to open up any space and elevates both traditional and modern styles, resulting in rooms that are both of the moment and enduring.